The exposed location of the u-shaped roof garden provides a spectacular 360° panoramic view. © Shlomo Aronson Architects Ltd.
An invitation to linger a while in the shade of the trees. © Shlomo Aronson Architects Ltd. 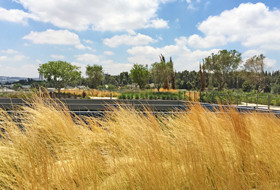 Various types of drought-resistant grass are an integral part of the vegetation. The large umbrella roof is reminiscent of the tent-like awnings in archaeological excavations. © Shlomo Aronson Architects Ltd. The slender flower heads of the white and blue Lily of the Nile are a real eye catcher. © Shlomo Aronson Architects Ltd. The grasses conjure up a moving image in the wind. © Shlomo Aronson Architects Ltd. Simply that feeling of well-being: a garden for relaxation and encounters. © Shlomo Aronson Architects Ltd. In addition to the deciduous trees, the evergreen, pillar-like cypresses set an incredible accent. © Shlomo Aronson Architects Ltd. The roof garden is worth a visit even at night-time, offering an impressive view of Jerusalem. © Shlomo Aronson Architects Ltd.
Jerusalem – holy city and cradle of three world religions, with deep cultural and historical significance and the highest density of museums per head of population worldwide. 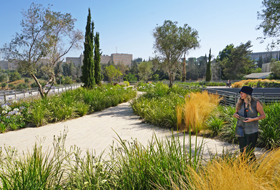 The National Campus for the Archaeology of Israel was built in the western part of Jerusalem, in the Givat Ram district between the Israel Museum and the Bible Lands Museum. The campus mirrors the open character and the closeness to the citizens of the Israel Antiquities Authority (IAA) which, together with this museum, wants to make the cultural treasures of Israel accessible to all people and to make archaeology come alive. A 1,600 m² large, public park has been developed on the roof of the building using the ZinCo system build-up “Roof garden”. It underlines the open and inviting face of the museum. Up to 2012, the Israel Antiquities Authority was housed in various buildings at the Rockefeller Museum. Work started on the construction of the National Campus for the Archaeology of Israel in 2006, the aim being to have all the central administrative offices of the IAA in one building complex. 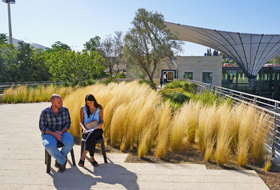 The campus is home to the most valuable collection of archaeological treasures in Israel and provides vibrant insight into the archaeology, ethnography and history of Israel. 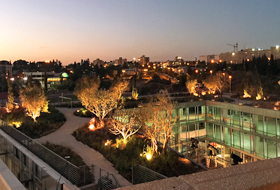 The campus includes air-conditioned archives, galleries, laboratories, an educational centre for students and the Mandel National Library for the Archaeology of Israel. Almost two million artefacts, including 15,000 fragments from the Dead Sea scrolls, are preserved there. The relics are hundreds and thousands of years old. Visitors to the laboratories can even take part in the archaeological conservation process for new archaeological findings, which used to take place behind the scenes. 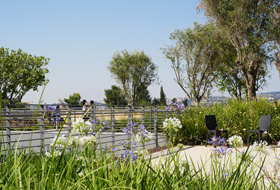 The National Campus for the Archaeology of Israel is a fascinating attraction for visitors, both from Israel and abroad. Architectural office, Moshe Safdie Architects LLC., were responsible for planning the building complex on the approx. 20.000 m² site on Museums Hill, embedded in the topographical conditions. This hillside location displays a certain parallelism with archaeology. After all, the soil is removed layer by layer on an archaeological dig and, therefore, we discover a number of levels. The campus is developed in three layers that fall away just as excavation layers do. You enter the uppermost of three courtyards at street level and move from that entrance plaza down to the lower-lying courtyards and gardens. In addition, landscape architects, Shlomo Aronson Architects Ltd. were commissioned with planning a garden on the 1,600 m² roof of the lowest building. 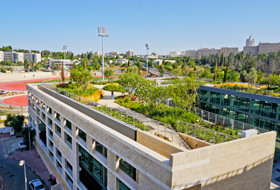 This roof garden offers a superb 360-degree panoramic view across the valley, the surrounding hills and cultural sights and the Knesset building, the Israeli parliament building. The building façades face the courtyards have metal panels in some sections, but primarily glass, which allows for the unobstructed view of the artefacts within. The outer-facing façades consist of stone, which provides for cooler room temperatures and at the same time reflects the structure of Jerusalem’s rocky limestone. A large umbrella roof completely spans the upper part of the building and in this way lends the entire campus a unique and very appropriate identity, as it mirrors the tent-like awnings which provide shade on archaeological excavation sites. This large-scale shading provides invaluable protection from the hot Mediterranean sun, particularly for the courtyards and the glass façades. At the same time, the umbrella allows the courtyards to be used for exhibitions and events all year round, regardless of the weather. For example, the mosaic courtyard where mosaics are restored benefits from this. The exhibition displays mosaics, many of which have never been on public display before. The architects had yet another clever idea for the umbrella roof: the roof is deeper at the centre and draws off rainwater through a circular opening, down to a ring-shaped water basin in the courtyard below. The visitors will get to see a small waterfall when it rains. The roof of the lower building complex, an area of 1,600 m², beckons you to take a gentle stroll there, to meet people and take a breather, or to have a read in the open air, the wonderful view included. The main pathway made of rectangular paving stones and lined with lush vegetation, winds its way in small arcs across the u-shaped roof. 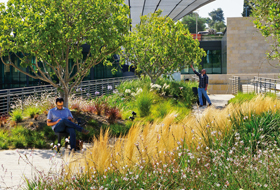 The drought-resistant grasses and perennials are suitable for the location and thrive here. The slender rising, pillar-like cypresses among the partly ground-covering and partly hip-high vegetation, set an individual accent in conjunction with the various umbrella-shaped deciduous trees. The diverse structure benefits, in addition, from the different substrate depths that ranging form 25 cm to 80 cm near the trees. The substrate used was perlite and regular fertigation (liquid fertilization via irrigation) was planned. Perlite is a volcanic glass, which, when heated to a high temperature (+1,000 °C) expands to a loose, porous structure, improving both water storage capacity and soil aeration. Apart from the substrate, using the correct technology with the substrate will ensure that the vegetation will always look magnificent. The basis for any green roof is a professionally executed roof waterproof membrane and this was already installed root-resistant on the new National Campus building. The ZinCo system build-up “Roof garden” was installed on this membrane, beginning with a Protection Mat that provides mechanical protection, stores water and nutrients and improves impact sound insulation. The loose rolls of mat, installed with a 10 cm overlap, also protect the roof waterproof membrane from tensile and shear forces that can occur during the execution works. The next layer, the drainage and water storage elements Floradrain®, is the heart of the ZinCo system build-up “Roof garden”. The roughly 1×2 m large Floradrain® elements have cells for water storage on the upper side, diffusion openings and an underlying channel system, which draws excess water safely to the roof outlets. Given that it was installed across the entire area, there is continuous drainage beneath both the entire greenage and the pathways. Floradrain®, in addition, has a high level of pressure stability which is important for all types of loads during execution and for the planned pathways and the weight of the intensive green roof. 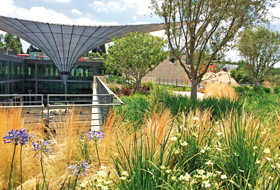 The drainage layer in the green roof build-up is covered with a system filter to prevent fine particles entering it from the overlying substrate layer. In this way, a so-called filter-stable drainage layer is created. This ZinCo system build-up provides the perfect basis for all the client’s green wishes. In order to ensure that the plants always have a sufficient supply of water, additional irrigation is naturally required in arid climates such as that in Jerusalem. Through its National Campus for the Archaeology of Israel, the Israel Antiquities Authority extends a hearty invitation to all who are interested in the history of Israel. With the architecture of this building, the architects have achieved a meaningful metaphor about archaeology and the design of a public space that incorporates each individual level of the building. 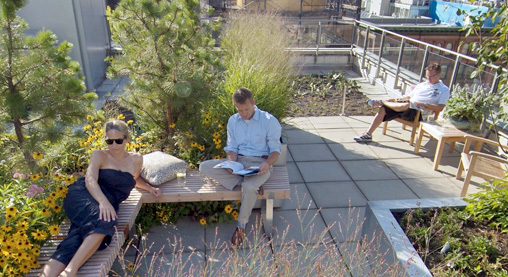 The roof garden, in particular, plays a significant role here. Thanks to a sophisticated lighting concept, it is a fascinating attraction for the visitors even at night-time.